CAJON PASS, Calif. -- Overnight progress has been made on the 37,020-acre Blue Cut Fire, which was at 68 percent containment Saturday morning, according to officials from the California Department of Forestry and Fire Protection. Officials estimate 105 homes and 213 outbuildings have been destroyed since the wildfire began racing through San Bernardino National Forest Tuesday, forest officials said, and the massive blaze has continued to burn near the Cajon Pass. A map shows the location of the Blue Cut Fire, which has burned thousands of acre around the Cajon Pass. There was still concern over "explosive growth" in extremely dry areas such as the southeast part of Wrightwood, where old growth, brush and trees haven't burned in 70 years, fire behavior analyst Brendan Ripley said. Late Friday, evacuation orders were lifted for residents of Phelan, west of Green Road to Snowline Road. However, about 34,500 homes remain under evacuation orders, including in the communities of Wrightwood, Lytle Creek and West Cajon Valley. Many were not being allowed to return home until damaged power lines are back up and running. "I'm hearing rumors that we can't go back until the power is turned back on, but many of us are prepared for that with solar panels and generators and stuff like that, so I don't really think that's an issue, but we're getting very frustrated because we've been out since Tuesday," said Lisa Holtsclaw, a Lytle Creek resident. An Edison spokesperson said there are more than 300 damaged power poles to replace, miles of wire to restring and a number of transformers to repair. Officials said Saturday morning 50 hand crews, 275 engines, 32 dozers and 14 helicopters were being used to work aggressively to gain more containment of the fire. Crews were also working to mop up all areas of the blaze in an effort to move toward re-population of evacuated areas. I-15 is up and running in both directions, but traffic will still be impacted by intermittent lane closures as repairs get underway to the highway. Gov. 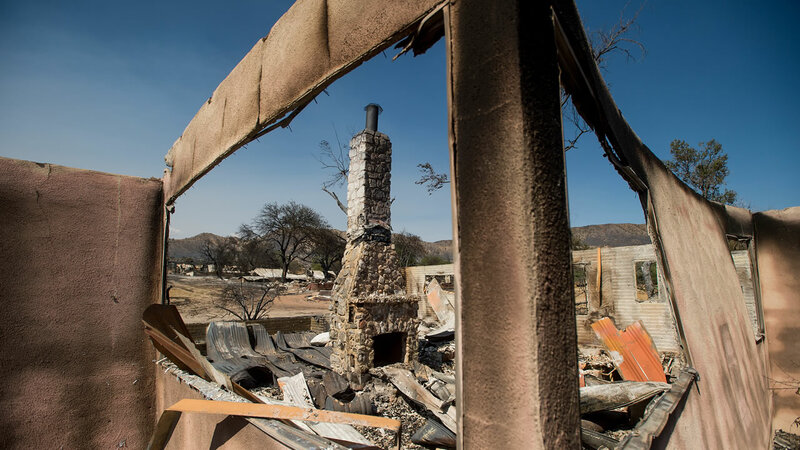 Jerry Brown issued a state of emergency for San Bernardino County, which provides more state resources to firefighting efforts and grants certain benefits to affected residents.